Uno Shield che consente di controllare un display LCD da 16x2 caratteri, backlight e tastierino, con soli 2 pin di Arduino! Utilizza il protocollo I2C. Display LCD non incluso. We really like the range of LCDs we stock in the shop, such as our classic blue & white as well as the fancy RGB negative and RGB positive. Unfortunately, these LCDs do require quite a few digital pins, 6 to control the LCD and then perhaps another 3 to control the RGB backlight for a total of 9 pins. That's half of the pins available on a classic Arduino! 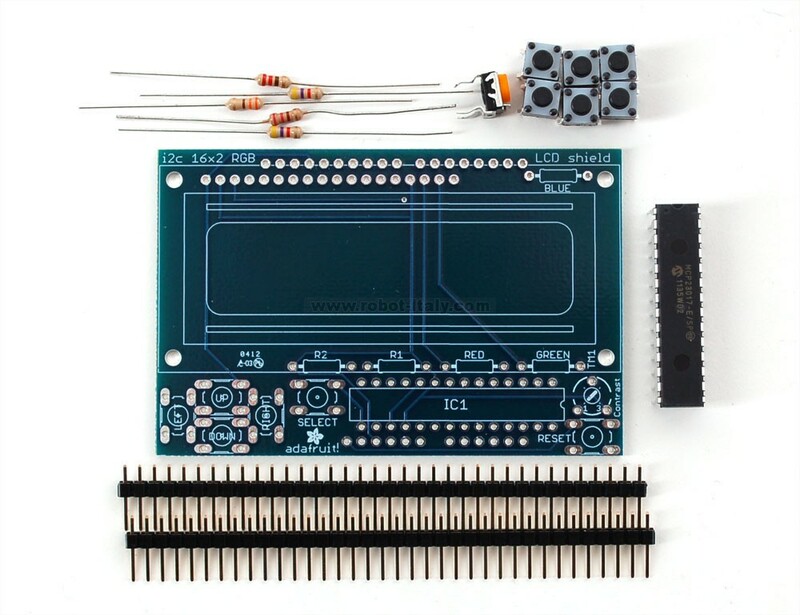 The shield is designed for 'classic' Arduinos such as the Uno, Duemilanove, Diecimilla, etc. It will also work perfectly with Arduino Mega R3's. Earlier Mega's have the I2C pins in a different location and will require you to solder two wires from the I2C pins on the shield and plug them into the different I2C locations at Digital 20 & 21. This shield comes as a kit! 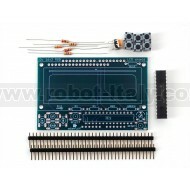 Included is a high quality, USA-made PCB and all the components (buttons, header etc). An LCD is not included, you will need to order one of our fine 16x2 Character LCDs - just pick up whichever style you like the most (blue & white, RGB negative or RGB positive). This kit has only been tested with the LCDs we sell and support, if you use another we will not be able to guarantee it works and we will not be able to troubleshot or support it! Of course, we even wrote an easy-to-use Arduino library that you can easily add to your project. It acts just like the built in LiquidCrystal library, but automatically uses the shield pins. You can also easily query the 5 keypad buttons to get input through the library, so you get extra buttons without using any more pins.